In this talk, local ornithologist Steven Reinert will share results from six years of field studies conducted in Rhode Island and Massachusetts coastal marshes. Each spring and summer in southeastern New England, salt marshes are inundated by flooding new-moon tides which exceed the elevation of most nests of our breeding tidal-marsh songbirds. Through his research, Steven reveals the fascinating survival mechanisms that enable salt-marsh birds to nest successfully in food-rich, yet risk-laden, tidal wetlands. 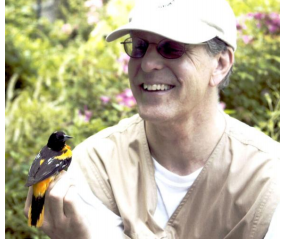 Steven Reinert has studied birds in Massachusetts and Rhode Island for over 35 years, and has authored several scientific papers, monographs, and book-chapters, on the region’s avifauna. His specialty areas are coastal- and estuarine-bird ecology, and land-bird migration. He received his bachelor of science degree in Zoology from the University of Rhode Island in 1975, and his Master’s in Wildlife Biology from URI in 1978. He has worked as an ornithologist for the University of Rhode Island and the Lloyd Center for Environmental Studies in South Dartmouth, Massachusetts, has partnered with the Environmental Protection Agency on studies of salt-marsh sparrow ecology, and has served on the boards of the Audubon Society of Rhode Island and the Barrington Land Conservation Trust. He is a Master Bird-Bander, and has served as the volunteer data manager for the Block Island Banding Station since 1996. Cape Ann, Massachusetts, routinely has great diversity of wintering sea birds. We will spend a day stopping at various spots known for finding interesting species, including Gloucester Harbor, Eastern Point, Andrews and Halibut Points, Rockport’s Granite Pier, Pigeon Cove, and spots along the coastline. Some birds recently reported include King Eider, Thick-billed Murre, Glaucous Gull, and Pacific Loon. What will be there on 2/20? Our group will car-pool and caravan around the route. We will leave the Providence area at 7:00 a.m., planning to be at Cape Ann around 8:40, and will bird until the light fades. There will be a spot near Providence to meet for those who want to share a ride up to Cape Ann, and a second rendezvous spot for those who want to meet us at the Cape. You MUST let the leaders know in advance that you are coming, and whether you will drive, if you can take passengers, or if you would like to grab a ride with someone else… we will coordinate rides, riders, and meeting spots. Even last-minute, we are glad to have you jump in but please contact a leader first so we know how everyone will fit. Pack a lunch, water, and snacks; we will find spots to take rest room breaks. Dress for being outdoors, and bring optics, including a scope if you have one. Join us in exploring the diversity of habitats found at Rocky Point State Park. We will walk along the shore of the Narraganset Bay where a variety of waterbirds may be found, comb through thickets and shrub lands for sparrows and other hedge specialists and glass the open fields for Raptors. Participants can expect to walk about 2 miles on mostly even surfaces. We will meet in the lot near the old entrance to the park at the end of Rocky Point Ave at 9am. Birders, winter have you down? Spring migration is still months away and many of the best spots are covered in a thick mantle of snow. Join us as we peruse the museum's collection of over 5000 bird specimens. From tropical toucans to extinct woodpeckers, you can view the wonders of the avian world up close and warm. Space is limited so pre-registration is required. Please note: Vaults accessible by stairs only. $3 per person (includes museum admission)/free for museum and Ocean State Bird Club members. Please call 401.680.7248 or email info@musnathist.com to register.